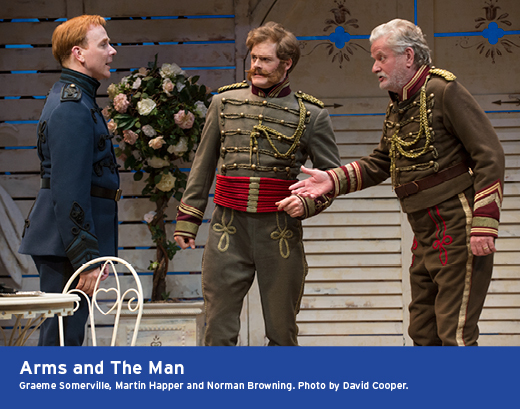 Morris Panych’s Shaw Festival production of George Bernard Shaw’s “Arms and the Man” touches on all, but doesn’t quite emphasize any, of the play’s possible themes — romance, nobility, heroism, adventure, social standing, military life, the ongoing nature of war. Nor does it take any consistent attitude towards all that happens in Shaw’s classic comedy. Raina, the daughter of a Bulgarian major (the highest rank in the Bulgarian army), and from one the finest families of her nation, is played by Kate Besworth as if she was the heroine of an early silent movie. A back of the wrist, just above the upturned palm, frequently finds its way to the character’s forehead as she reacts, eyes turned towards the heavens, melodramatically to situations. Besworth’s Raina is a romantic, but she shows few signs of being the Shavian woman who is clever and self-possessed behind her façade. The rest of the Petkoff family seem more boorish than necessary. Shaw makes it clear that the Petkoffs have only enjoyed high social stature for 20 years, and specifies that their famous library has a paucity of books, but in the Bulgaria he depicts, 20 years is a lifetime of civilization, and having any books is a sign of amazing interest in the intellect. Laurie Paton and Norman Browning, particularly the latter, are entertaining in the their roles, but one wishes for a bit of nobility to go with their studied hauteur. It would be better if more of the airs they put on seemed acquired as opposed to being parvenu poses. Panych’s take on “Arms and the Man” lacks definition. Except for Ken McDonald’s interesting clock-gear set, little seems to be thought out in a way that gives Shaw’s play the delightful verve one expects from it. Everything seems to random, as if the actors had to fashion their performances entirely on their own, and as if Shaw’s lines and plot was considered enough to do all of the work. Of course, Shaw’s lines and plot are enough to suffice, but I would prefer an “Arms and the Man” more targeted to a specific theme, with characters that personify that theme, to Panych’s looser approach. His production lacks the commanding discipline the character of Bluntschli brings to Shaw’s show as he uses his native wit and military experience to extract the Petkoff family, and Bulgaria, from large messes into which they’ve gotten themselves. It is never boring or dense, but Panych’s staging never grabs you and keeps you focused on the action. You find yourself following a story and being amused by it more than you feel involved or engrossed in it. “Arms and the Man” established Shaw as a playwright and as a master of comedy. Previous plays, one of which, “The Philanderer” is given a marvelous turn at the Shaw Festival this season, brought the writer some attention, but “Arms and the Man” gave him permanent literary and theatrical stature and made him popular. I, for one, look forward to any production of the play and any of its offshoots, such as the Oscar Straus operetta, “The Chocolate Soldier,” that Daniel Pantano’s Concert Operetta Theater has planned for the upcoming season in Philadelphia. The comic tone speaks for itself. Bluntschli, a Serb mercenary in retreat after a lost battle, feverishly enters the bedroom of a young Bulgarian woman, Raina, to hide from the victorious Bulgarians who would kill him on sight. He learns the woman, with whom there is mutual attraction, is betrothed to the alleged hero of the battle just fought. He is on the brink of shattering Raina’s illusions about her swain but relents and realizes the girl is too smitten with the panache of the occasion to be enlightened anyhow. Bluntschli and Raina both behave bravely towards the other, but Bluntschli is most grateful when Raina slakes his hunger by offering him four pieces of chocolate on which to nibble. Bluntschli will later come back to the woman’s home to express his gratitude for Raina’s hospitality and return a coat that was lent to him. There he meets Saranoff, the hero of the battle and Raina’s heart, and a rivalry ensues for the lady’s hand while practical matters of war and its aftermath are being discussed. In spite of some seriousness when comments about war and peace take center stage, “Arms and the Man” is primarily a romantic comedy that contains a barrage of wonderful Shavian one-liners and a wonderful passage in which Browning, as General Petkoff, expounds on the dangers of one bathing too frequently. Panych and his ensemble bring out of the comedy, but jokes seem to play line by line or situation by situation instead of smoothly in a unified piece. The Shaw production works best when Graeme Somerville, as a wily and amused Bluntschli, and/or Martin Happer, given to random seconds of blustering histrionics, but mostly a realistically self-effacing, self-critical Saranoff, take over a scene. Verbal duels between Somerville and Happer are particularly delightful. These two actors seem to come up with an overriding tone for this Shaw production that Panych missed. Norman Browning fits in well with them when he is part of the action. Claire Jullien, as the Petkoffs’ serving maid, Louka, also shows her mettle in sequences with Happer. Panych’s production is hardly a failure. It entertains solidly enough. It simply plays at one level and lacks the highs and lows that make theater exciting or arresting. It also seems to play on the surface without getting too deeply into anything thoughtful that Shaw broaches. Besworth’s Raina seems at times to be in a different play from the one Somerville, Happer, Browining, and Paton are doing, and the relationship between the engaged servants, Nicola and Louka, isn’t pitched to contrast the similar understanding between Saranoff and Raina. Claire Jullien finds a stride in her scenes with Happer, but sequences opposite Peter Krantz, as Nicola, seem cut-and-dried, Krantz being among the actors who never find a tone for their characters and appear more like stock figures in comedy than performers individualizing their roles. Somerville and Happer tend to galvanize the scenes in which they appear. They have put their characters on a steady course and show who they are as humans, becoming more than the fictional inventions of Shaw’s brain. Somerville establishes Bluntschli’s logical and caustic sides right away. In his first scene in Raina’s bedroom, he shows both the expected nervousness and the threatening ruthlessness of a man being hunted while conveying the practical air of the professional soldier, a veteran campaigner who adds adventure to what would otherwise be a routine Swiss life by joining armies in combat as a mercenary. Bluntschli calmly states he fights for the Serbs because their troops came down a road he was on and recruited him before the Bulgarians did. Shaw makes the position of the professional warrior even clearer when he has Bluntschli explain neither the Serb nor the Bulgarian armies know anything about battle strategy, so their forces are led by Austrian or Russian officers anyhow. War is a career for Bluntschli, who has no allegiance to any combatant and goes into battle for pay and for refuge from a life he believes would be day after day of bureaucratic drudgery. Somerville finds the wit and dash in Bluntschli, but mostly he plays his competence and practicality, both of which, given the confusion he resolves, make him quite attractive. Except for a scene in which Somerville delivers a long passage while pacing on top of the Petkoffs’ table, a behavior I consider out of character for Bluntschli and ill-judged by Panych, the actor is superb in his role as the knowing, superior Swiss setting the less adept Bulgarians on the right course and vying for the hand of a woman he has come to love, although in this production, one wonders how. Somerville knows how to act the gentleman, the suitor, the soldier in need, and the man of common sense who is able to straighten out the most complex mess. He does all of this conveying full knowledge and confidence about his talents as a adult man who has seen many lands and lived though all kinds of situations. He cannot be a fool in love even after he realizes he is smitten by Raina. Somerville brings out Bluntschli’s easy worldliness and comfortably expresses the assured bearing and immediate understanding it gives him. Martin Happer’s Saranoff is far less confident. He affects ease and pretends to be in control of matters, but he knows his manner is one of bluff and bluster. In private moments, Saranoff confesses to Louka that he hates himself for the show he puts on and that he doesn’t want to be a hero at all but live as a country gentleman enjoying the mild comforts of his wealth and social position in Bulgaria. Saranoff can be stubborn. He staunchly says he will not apologize or will not capitulate whatever the situation or stakes. His pride is also for show. Saranoff is romantic in a different way from Bluntschli or Raina, and Happer lets you see that Saranoff would be most content as a virile puppy who plays coyly with some woman all day while being petted and teased and getting to snarl and tease back every once in a while. Happer’s is a good portrait of self-understanding and self-effacement. Saranoff rolls his eyes at himself and laughs at the posture he knows he is taking. When alone, he even takes it in stride that the charge he led, the one that sent Bluntschli running helplessly into Raina’s bedroom, was a major blunder that only succeeded because the Serbs did not have the right gauge of ammunition to put into their guns and were left with retreat as their only sane option. Saranoff doesn’t want to be soldier. He only wants the accolades and adulation that comes with a handsome uniform he can wear with rehearsed swagger. Saranoff may be accustomed to posing and living up to an image, but he enjoys his charade as little as Bluntschli would. You see his true nature in Happer’s scenes with Jullien, in which each is betraying his or her affianced. All of a sudden, there’s a sincerity behind Saranoff’s pose, one Jullien’s Louka spots and takes full advantage of. Saranoff also knows his bravado cannot hold against Bluntschli’s competence, and Happer is shrewd to look a little relieved when Bluntschli declines to participate in a duel Saranoff’s conventional side prompted him to demand. 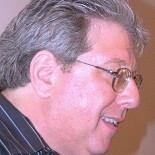 He is also relieved when Bluntschli solves a major problem regarding orders to Bulgaria’s now unneeded troops. Somerville and Happer show the contrast in Bluntschli and Saranoff. The difference is meant to impress Raina, but Besworth’s Raina, seems indifferent to either of her suitors’ approaches. Even in the scenes in which Raina unwittingly seduces Bluntschli, Somerville does all of the work. Shaw scores a point because his intention of comparing the professional soldier with a bumbler, made an officer more because of his social position than his military skill, comes through. Ken McDonald’s set for Raina’s bedroom and the Petkoff garden seems meant to suggest a look of Eastern European gingerbread. The moldings have prettily carved peaks and patterns. All seems homey in a Danube sort of way, especially when Mrs. Petkoff hangs wash in the garden. The library of which all the Petkoffs boast is a different matter. Mrs. Petkoff has had it refurbished to reflect a modern room with modern comforts. She delights in an electric bell that was installed to summon her servants. The Shaw Festival audience will marvel in the mosaic of gears McDonald fashioned together for the library’s upstage wall. The wheels of various diameters, all with gear-like teeth on their outer edges, captivate the imagination. They evoke a theme that seems missing in the dramatic action on stage, namely the passage of time and how, throughout history, from centuries before “Arms and the Man” is set to the 120 years that have elapsed since its premiere, countries have seen men marching off to wars of various degrees for various causes. McDonald manages to fascinate and provoke thoughts Panych cannot (although I imagine the wall of gears was part of Panych’s conception for this production). The set is a kind of puzzle the first it appears. Its meaning becomes clear as you cogitate on how the mass of widgets came to be. It comes across as a kind of brilliance you wish was mirrored in the production at hand. “Arms and the Man” runs until Saturday, October 18 at the Royal George Theatre of the Shaw Festival, 85 Queen Street, in Niagara-on-the-Lake, Ontario. It is performed in repertory, so showtimes are staggered. Tickets range from $113 to $35 and can be ordered by calling 1-800-511-SHAW (1-800-511-7429) or by going online to http://www.shawfest.com. This entry was posted on August 24, 2014 by nzoren in Theater Reviews and tagged Arms and the Man, Claire Jullien, Classic, Comedy, George Bernard Shaw, Graeme Somerville, Kate Besworth, Ken McDonald, Laurie Paton, Martin Happer, Morris Panych, Norman Browning, Peter Krantz, Royal George Theatre, Shaw Festival.